I remember vividly, a few years ago, the director of a local sexual assault organization asking me why I talk about sexual health so much. What does that have to do with sexual violence prevention? Well, I told her, a lot. 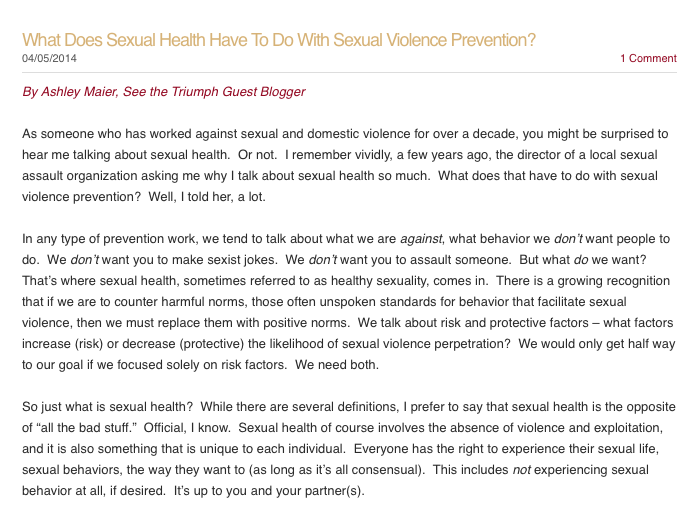 The blog is both an homage to sexual health promotion and a call for connection. Let’s connect our work to sexual health. After all, what are we for if not, as I say in the post, “the opposite of the bad.” In a nutshell, that is my approach to sexual health – simple in its clarity. For more on sexual health, take this eLearning course.